When I had first heard of the London Stock Exchange Occupation protest in London I was sceptical that the protest would last more then a day. I had arrived at Paternoster Square around 10 am in the morning and saw many police and press hanging around. At around noon I could see the crowd of people getting bigger outside St Paul’s and decided to go check it out. Within half hour the crowd numbered in the thousands filling every part of St Paul’s. The police presence also grew and after an attempt by the protestors to enter Paternoster Square the police started to form lines first blocking off the road while encouraging the protestors to move into the road. One group of protestors attempted to leave the area but were prevented from doing so by the police who claimed that there was an “absolute cordon” in place. This is simply another term for Police Kettle. Eventually the protestors decided to set up camp at St Paul’s. The police line had by this time stretched all around St Paul’s with people being denied the right to enter or leave St Paul’s. One group of police officers dropped of supplies of water which I presumed was for the protestors. It had been decided by a court earlier in the year that the police kettle was illegal due to the fact that people had no access to toilets and water. 5 toilet cubicles were also dropped off and it became clear that the police intended to keep the protestors in the kettle for a long time. This really had no effect since the protestors had already decided to occupy the area and was happy to stay. Police TSG (Territorial Support Group) pushed their way through the thousands of protestors pushing many down the steps of St Paul’s and forming a police line at the top of St Paul’s steps. Many people were hurt including one independent journalist who was pushed down the steps and came close to receiving a kick in the head. The TSG officer had missed and instead kicked a fellow officer who had also fallen beside the journalist. Later a TSG officer had collapsed and had a seizure and I suspected this was the officer who had been kicked by his colleague. I found myself spending a night on Day One (October 15th) of the Occupation and from there on went to video the protest day to day going back home during the night and uploading the footage onto YouTube. On the 28th this all changed as my family moved up north and I no longer had a home in London. From then on I spent every night at St Paul’s taking video and getting involved anyway I could which involved helping out at Supplies tent. I came across an article in the Daily Mail (October 29, 2011 – Page 32-33) which was written by one of their reporters Tom Rawstorne. Mr Rawstorne had gone undercover for a total of 48 hours at the London Occupation protest at St Paul’s and described the majority of protestors as “pot-smoking, part time protestors who put partying before politics”. This didn’t appear to support what I had seen myself whilst videoing the protest. Tom Rawstorne claimed “a key activity is sitting around smoking joints and knocking back lager” yet I found it hard to imagine that the Police would sanction such drug and drink use at a holy site. Police are constantly patrolling around the tents looking for any excuse to remove the protest so it was unlikely that Mr Rawstorne was correct in what he was saying. Mr Rawstorne also repeated a ridiculous claim in his article that “on Tuesday, this newspaper revealed that only one in ten of the 200-odd tents are occupied over night. Evidence of this came from a thermal imaging camera deployed from a police helicopter”. Mr Rawstorne claims to have spent 48 hours at the occupation yet failed to visit the Supplies tent (now located by the Tea tent) once. If he did he may have understood why the thermal imaging camera’s had problems detecting body heat. 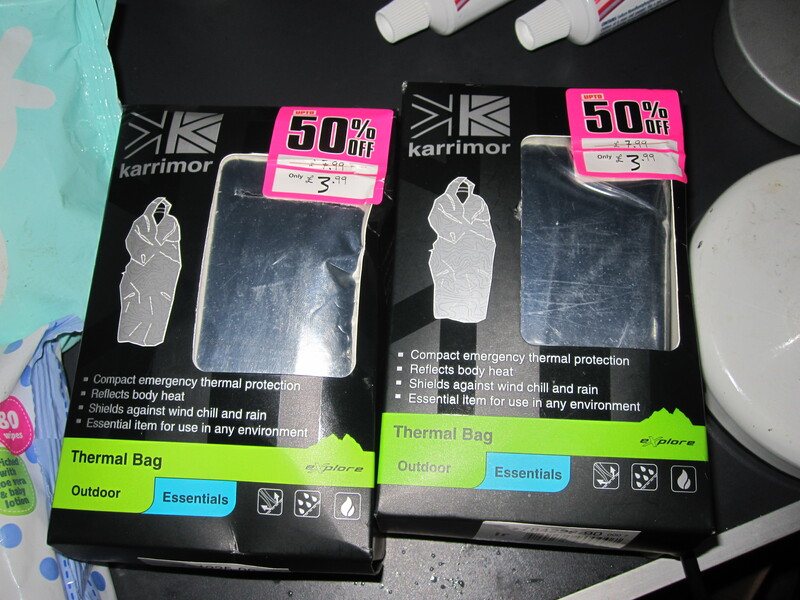 It’s called “Thermal Bag” by a company called Karrimor, which appears to be a popular donation to the Supplies tent. I had personally seen a box load of these blankets being dropped off at Supplies and distributed to all that wanted them. Furthermore, I struggled to get an empty tent during the night since all the tents were occupied. I thought I could find an empty tent at Finsbury Square (a second occupation protest camp on Moorgate EC2) but that too was full which left me with only a few limited options such as the University tent which doubled as a sleeping area during the night or the Supplies tent. The general mood at the occupation protest was that off a desire to end corruption, greed both by the private banking system and the Government which supports and props up the system with billions in public money. Anti capitalists are at the occupation but for every anti capitalist I came across I also found those who supported capitalism but was against the corruption. One protestor who wished to remain anonymous told me of his dream to see capitalism washed clean of the greed with everyone receiving equal benefit and being able to live a comfortable life. The idea is for anyone to join in making improvised music. I get out my camera and start recording this wonderful performance. My battery runs out rather quickly and once the night is finished I make arrangements with the guys to come back the following night to record some more video. St Paul’s is buzzing with much activity from musical events to discussion groups where everyone is free to join in if not encouraged. One of the many discussions I come across is of office workers speaking with the protestors and debating over capitalism, greed, banking, money, etc. The debates are rather friendly with people passing by sharing their views and opinions amongst the people. It’s now the night before November 5th protest with a buzz of excitement of the upcoming protest march to Parliament Square. The police have informed most people at St Paul’s that they face arrest if they take part in the protest march which aims to bring awareness of both of occupation at St Paul’s and the common goals of removing greed and corruption from the Government and the financial institutions. Many are not deterred by the threat of arrest especially after hearing about the police brutality which was dished out to the Squatters Rights protestors on the night of October 31st at Parliament Square. 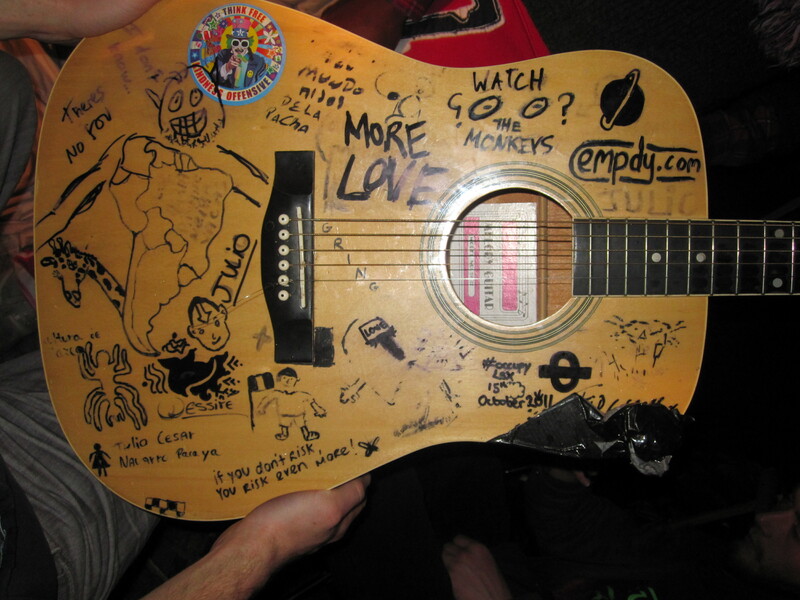 I had been invited to spend a couple of nights at a squat in North London. The people running the squat known as “caretakers” show me around and explain how this temporary home provides a warm place and shelter for those unable to get a place. The building is due to be demolished with the present occupiers looking for a suitable alternative to move into. One of the requirements being an un-used building. One caretaker explains to me the arrangement he has with the current owners with a date to move on after handing over the keys. Unlike the stories you hear in the tabloids these squatters have no intention of entering anyone’s home or office that is currently being used. Their intention is not to make anyone else homeless. I agree to stay at the squat during their move to video record and document the move. During the night musical instruments are played by various visitors and squatters. The mood is peaceful and friendly with family and children present. Someone explains to me that during the day visitors are encouraged to come and visit the squat in order to get to know the people and better understand the situation they find themselves in. The next morning I leave the squat and make my way down to St Paul’s with some of the caretakers. When we get to St Paul’s I find over 1000 people are waiting for the protest march to begin. I video record a couple of different angles and go along to the supply tent to see how the guys are doing there. It’s easy to get lost in deep conversations regarding the financial situation we find ourselves in and miss the start of the march. I decide to make my way straight to Parliament Square where I meet up with some long term protestors at the Peace Strike which has been present outside Parliament for over 5, years. The police presence is heavy with over 100 police vans parked at various locations around the square. I hear from some friends that the protestors are being blocked from passing Downing Street and notice that the police start to block off Great George Street and Victoria Street so I take my camera out and start filming the situation. I notice a high ranking officer giving instructions over the radio and to his colleagues telling them that L2 should secure the outer boundary of Parliament Square whilst L3 should remain inside. I follow the Chief Inspector around as he gives instructions. Eventually the Chief Inspector instructs a constable to stop me from filming him and I am detained for a short while for a stop and account. I refuse to give the officers my details and am allowed to continue. After a while a group of protestors manage to get to the junction of Parliament Square on St Margeret Street which takes the police by surprise. They quickly run over to this junction and begin pushing the protestors backwards. I start recording as I approach the protest and stay on the outside of the police cordon. One officer comes up to me and pushes me to the ground in front of a police van that is attempting to block the road. The same officer tells me that I am blocking the police van and I wonder why he pushed me into its path in the first place. After a couple of minutes two officers come over to me and grab both my arms whilst dragging me into the protest. I am then pushed into St Margeret Street and find myself within the police kettle. Police appear to be confused or unwilling to admit that there is a police kettle in operation. I suspect this is due to the recent court decision that made such police kettles illegal unless both toilets and water were available. I am told by the officers that I can leave via the other end heading away from Parliament. I explain to the officers that I wish to go back to my original position but I am denied this right. I then go to the other end of the police kettle and ask if I can leave. The officers explain that I am in an “absolute Cordon” and can not leave. I ask the officers why they are kettling everyone here whilst the other officers are telling everyone that they can leave. The officer’s reply to the question is that it’s not a police kettle. Another officer admits to me that it is a police kettle but they are not calling it a police kettle because there are no toilets and water available. Eventually a police chief inspector informs people that they are unlawfully protesting and must leave the area. I again attempt to leave the area but I am told I can not leave due to the cordon. I wonder if this is a police tactic to make people confused and angry or if it’s simply incompetence and that the police officers enforcing the kettle are too dumb to understand the words of their chief inspector. A mini General Assembly is held on the street with a vote given to either stay as one group or to leave and meet up at Trafalgar Square. The consensus from the GA is to meet up at Trafalgar Square and the police inform us we can now leave. Three officers from the Forward Intelligence Team (FIT) are within the police kettle so I go to video them as they give descriptions of the people talking at the GA. After a while I stand in front of their cameras and block their view as they attempt to take pictures of the peaceful protestors they are describing. They later leave the police kettle and take pictures from outside the police line. As there are a lot of placards on the floor I pick one up and attempt to use it to block FIT from taking pictures. The placard is damp and ineffective so I place it back where I found it after a short time. As the group attempt to leave police still block us from leaving and the police kettle gets even smaller as the people move towards the far end trying to leave. I then take a video which involved going around the edge of the police kettle at which time the police then allow one at a time to leave. I opt to wait till the end in order to video any arrests at it appears they are still preventing certain people from leaving. Once most of the protestors had left the police kettle a group of officers rush in and start arresting people pushing them to the ground. I start recording this and two officers grab me and start pushing me down the road telling me I must leave the area. I am taken to an outer police cordon and ask if I am ok to stay there. The officer nod to say yes and go back to the small group they have arrested. I ask the officers at the outer cordon why they are treating peaceful protestors like this. The officers attempt to explain their actions and I am then arrested by another two officers who inform me that they gave me a chance to leave the area. I am now under arrest for “unlawful protest” and placed in handcuffs. I offer no resistance and sit down on the ground. Initially the officers attempt to drag me to the police van but another officer tells them not to do so as it would damage my shoes so I am picked up and carried to the van. During this time one officer was pinching me under my right arm so I elect to walk into the police van in order to stop the pain. Whilst in the police van I explain to the officers that I was not protesting but was video recording the event. I also tell them that that if I had intended to protest I could do so under the SOCPA authorization of Peace Strike and that they could check this with Maria at Peace Strike. The officers smile and tell me they don’t know of any Peace Strike protest outside Parliament. The inspector in the van asks me if the lady is wearing a pink jacket and I explain that there are two separate protests and that the lady with the pink jacket is not who I am referring to. I also describe the blue tardis called “Peace Box” and another box which looks like 10 Downing Street which is located opposite the House of Commons entrance. The officers tell me that no such protest exists and that it would not be possible for any such protest to get authorization because the police are no longer giving authorizations out. I then argue the point that if no authorizations are being given out can this country claim to be democratic whilst banning protests. Another officer then tells me that I am a protestor for simply being amongst other protestors. He then explains to me that he is just following orders and I reply that the nazi’s were also following orders to which one officer tells me that some officers in the police van are Jewish. I explained that it was not relevant if any officers were Jewish since it’s a known fact that the nazi’s had Jewish police who would lead other Jews to the death camps. Another officer then told me that it was good that I was talking as it gave him much to write about. I told the officers that I had nothing to hide and that I considered my arrest a wrongful arrest due to the fact that I was not protesting. Once at the police station I was kept in handcuffs and spoke with the officers about war criminals and asked them why they were not arresting David Cameron and Nick Clegg for their illegal actions in Libya. I also mentioned the Geneva Conventions, Rome Statute and the Kellogg Brian Pact including the Maastricht Treaty. I was laughed at and told that I was wrong and that no war crimes had been committed. I advised the officers to look at the UN Charter which clearly stated that the UN can carry out any action NOT involving the use of armed or military force. I told the officers that they should be dealing with serious crimes and not arresting people for peacefully protesting. Before getting to the police station the officers had told each other that I would not be getting my cameras back as they were being seized as evidence. I believed this was a tactic to stop me from making videos and told them of my suspicion. During my time in the police cell an officer came and explained that I would not be getting an interview due the change in procedure. I guessed this was due to the fact that the law had been repealed and a police interview may embarrass them. I was then informed that I had a welcoming party in the reception and was shown a group of people on the CCTV. Once I was released into the reception area I was greeted by people from the LSX Occupation Protest who had been waiting for our release. In total eleven people had been arrested with one being charged with Public Order Offence and being kept in police custody until his appearance on Monday. It was a good to have a group of people waiting at the police station and gave me a moral boost knowing that I was not alone during my incarceration. Eventually a mini GA was conducted in which we reached a consensus that people would attend the court hearing for the last man in custody as we could benefit the protest more by carrying out other actions. Later back at St Paul’s I spoke with many people regarding the arrests of the night including showing them my charge sheet with my reply to the false charges. “I was not protesting today, but I was thinking of protesting at the end of the week”. At the time I didn’t realise how funny that would look would appear with one person telling me that it was like a Monty Python joke. In fact the entire police action including the arrests seemed to come from a Monty Python show rather then real life. For those who were protesting and got arrested for “Unlawful protest” it must have seemed like reality and common sense took a back seat. To think that it is illegal to protest without seeking authorization in what many regard as a democratic country. I am now forced to think of the United Kingdom as a dictatorship which pretends to be a democracy. The UK abuses the word democracy so often when it drops bombs killing innocent people in its name. Many people shed their blood for what they thought was a democracy. Would they have died defending this country from the nazi’s if they could see the outcome today? One has to wonder. Since I can no longer have any of my cameras I find myself getting involved around the camp in anyway I can. I start to help out at the Supply tent organising the various donations that have been dropped to us and dealing with requests for items such as blankets, socks, pillows, sleeping bags, soap, shampoo, etc. The next few days I stay at the Supply tent helping out and enjoying the live stream music during the night. At one point we have a range of different musical instruments and singers who have come together to improvise songs that sounds more impressive then anything you could find on the CD shelf of HMV. As I sit their watching the music happen I wish to myself that I had my camera but I am glad to see that there is another cameraman capturing this special moment. In the morning I am invited to talk on live stream regarding my arrest at Parliament Square for unlawful protest. I do this to an audience of over 2000 people which gives me a further moral boost knowing that others are aware of what actually happened even if I have no access to the video footage which I took. The next couple of days go quietly with the odd argument here are there but mostly its debate and conversation over the failed system we all find ourselves living under. On the 7th I was approached by a man who showed me a face book picture of a young man and asked me “Have you seen this guy”. I replied to him “No comment” sensing he was an officer looking for someone. He then explained how he nephew had been missing for four days and that he and his father were frantic to find their missing family member. I told the guy that I was sorry but that I couldn’t help him and advised him to speak with the police who were walking around the area. He then told me how he understood why I was like this and insisted that I help him. I repeated my “no comment” to him sensing he was not who he was claiming to be. I felt guilty when he walked away but my suspicion was confirmed when the guy who was dressed in a hat covering a bald head, black leather jacket, jeans and grey scarf shared a joke with an older guy who had died black hair black coat and black trousers. Both appeared to be smiling about something and after a few moments the older guy approached me and said “I take it your no comment means the guy is here”, I told him that if he was really the father looking for his child then he wouldn’t be standing around smiling and laughing. I also said “If it were my son who was missing I would be looking in every tent until I find him”. The older guy appeared angry and walked off. I later spotted both men with a coffee watching me and the guys I was with. Seems drinking coffee and joking is more important then looking for his missing family member. Pictures of the two gentlemen were taken and now everyone who needs to know can see what they look like. On the night of November 8th people are concerned by the news that the police intend to use guns with rubber coated bullets. Most people understand that such weapons are still lethal even if the police wish us to think otherwise and the police waste no time in telling people at the camp of their intention to use them should they feel it necessary. Conversations regarding such police tactics go on throughout the night but one thing is clear. No one is deterred from going on the students protest march. Any use of such weapons against children would make the London Riots seem like a pleasant day and it’s no secret that the police know this so at least we are assured that the weapons will not be used unless the police wish to start a violent revolution. As part of my bail conditions I have been banned from entering the City of Westminster on November 9th, the next day. In the morning I follow a small group of protestors on route to the start of the march but I am forced to stop at the boundary to the City of Westminster. Upon trying to get back to St Paul’s I am informed that I am not allowed to do so while people dressed in suites are free to enter and leave the police line. It feels like I am being discriminated against even though I am dressed in black trousers and blue shirt. One officer explains that I can get to St Paul’s by following the route up the next road where I am promised the police have not blocked the roads off. I soon find out that this is a lie and upon trying to get through I am pushed to one side. I explain to these officers that I am trying to get back to St Paul’s since I am on bail conditions and can not enter the City of Westminster. They take me to one side and promise to let me through once they have completed their checks. I give them my details and they inform me that I am being searched under Section 60, which has been authorized by Smith. The time was 14:06 and I was at the corner of West Harding Street and Fetter Lane. The two officers were officer Rabbit (NI 440) and officer Whalley (NI 687). One of the officers tells me that he recognises me from Soho Square during the Royal Wedding. I tell the officer that he must have seen my video at which he nodded his head. It appears my youtube channel is famous amongst the police. The officers tell me I must join the protest and being unsure at the boundaries along the route I explain that I can not proceed. Eventually the protest begins to pass through and I am able to speak to some legal observers who tell me that I am safe to continue along the route. Along the way the police stop forcing everyone to stay static with nowhere to move. This last as long as 10 minutes before the police slowly edge forward until they again make the protestors stop. It appears the police are looking to agitate the crowd who chant to the police to keep moving and let them move. The police continue this tactic until some in the crowd throw bits of paper and other soft objects. A police hat is thrown from the direction of the police line and one protestor who catches the hat gets some snaps of himself wearing the police hat before passing it to a girl who wishes to throw it back to the police but hesitates maybe thinking that she will get into trouble for throwing the hat at the police. Eventually she manages to get within distance of the police and pass them back their hat. The actions of an anarchist I guess since anyone else would simply keep the hat or burn it instead of handing it back to them. Eventually the police line becomes thin as it reaches a square. At this point it was clear to see by everyone that the police could no longer maintain the line but the protestors chose not to try and break the police line. Seems there was no reason this time as the police didn’t attempt to stop anyone for 10 minutes at this section. I guess the protestors (a mixture of students, workers and various other groups of people) didn’t have a need to feel agitated like they did earlier when being kept from moving. I now find myself in front of the police line and further down the road another line of police officers forms a second police line which starts pushing anyone who can not keep up a fast walking pace while screaming at them to move backwards. Of course the idea of walking backwards only works if everyone is facing the police. Clearly the police training only deals with confrontation instead of peaceful people walking forwards away from them. Along the way I see officers attempting to grab random people with one guy pushed to the ground and dragged along the floor. He had a scarf around his neck. The weather was pretty cold and I was wishing I had a scarf myself. Nonetheless, I saw no reason for the officers to treat people like this. One young girl was pushed rather hard into another group of people. Maybe the police expected her to push the people in front out of the way. Unlike the police, peaceful protestors do not enjoy using physical violence and so she was continually pushed until the police slowed down their pace. At around 15:07, officer FH499 VELLA, saw me taking notes and down and informed the other officers around him to watch out around me. About 11, minutes later I came across officers from FIT (EG ZD 57), (4659) and (EG ZD 365). During the London riots I noticed how the officers seemed to just stand there and allow the violence. Their excuse for this was that they didn’t want to act aggressive because of all the incidents such as the death of a peaceful man by the name of Ian Tomlinson. Of course I knew this to be a rubbish excuse since they had no problems dishing out pain to peaceful protestors just before the London Riots. Of the record I had asked many officers if they were ordered to stand down and it appears that was exactly the case. Now why were officers told to stand down in the face of violence and looting? Maybe the peaceful protestors are a soft target and the police know they can get away with treating protestors like criminals. Once we reach Moorgate EC2, I notice a shop open and jump in to get away from the pushing police officers. I then re-enter the march this time in between the first row of police officers pushing members of the public down the street and a line of police officers pushing protestors backwards. I get out my notepad and pen and the officers seem to leave me alone. I guess it would have been a different matter if I had pulled out a camera since the police seem to have no problems with people taking notes on a pad but are worried at the sight of a video camera. What have the police got to hide, apart from the police brutality and a lack of common sense? The protestors are kept on Moorgate for around 10 minutes as a trickle of protestors are allowed to pass through. Just after 15:38, I see a young black girl targeted by the officers and arrested. The two officers who make the arrest are RG 735 and RG 513. The girl offers no resistance yet the officers stretch her arms while running her down the road. I ask the officers which station the young lady is being taken to but I am ignored. I then ask officer U5095, who replies “don’t know”. I ask him if he can find out but he informs me he is TSG (Territorial Support Group) with 5 Area. I am with a group of the most senior officers and ask them which station arrested people are being taken too but they also ignore me. It appears they don’t like the idea of large numbers of people occupying the police reception area for which the police are powerless to stop. This is because the police station is a public place and covered by Audio CCTV. 10 minutes later I over hear an officer (HT 496) tell other officers to be on the look out for people with coms (communication equipment). Another officer then indicates to arrest anyone with such equipment as it appears it’s now illegal to carry anything that could be used to communicate. I ask the officer why they are targeting those with coms and the officer’s move away from me ignoring the questions. At 15:49, a senior officer (197561) with a red epaulet shouts an instruction to his officers “hats off” at which point all the officer remove their riot hats and replace them with soft caps. The protestors are now kept in what appears to be a kettle with no communication between the police and those being prevented from free movement. Another senior officer by the name of Any Howe calls over the radio for “BG reinforce the line” at which point four separate police lines and created. Another officer asks the senior officer if this is the end of the march route. It appears they do not wish to let anyone continue past Moorgate station as they don’t want the protestors to reach Finsbury Square Occupation. The time is now 15:53, with another senior officer (179703) talking to other senior officers about allowing the peaceful protestors to continue. Eventually the police move to one side and the protestors are left to march alone up Moorgate to Finsbury Square. No attempt is made to control traffic which turns into Moorgate and travels towards a blocked road of protestors. One care nearly runs me over as my back smashes his wing mirror off. It appears he was not looking. Maybe the best role of the police during the day would have been to close of the roads to traffic instead of trying to agitate peaceful protestors by treating them like criminals. Even the EDL are able to march where they want including to Parliament yet peaceful protestors are treated like sheep being made to follow a long route that the police decide. At 16:16 I eventually make it to Finsbury Square where I see three coaches parked up and a military formation of police officers marching in line to the coaches and getting into them ready to leave the area. Seems the police never expected any violence from the peaceful protestors as they prepare to leave while thousands march towards what is still a financial district. The aim of the march was to go past the Bank of England which as anyone knows is a fortress consisting of a large brick wall 3 floors high around the entire building. Unknown the protestors there is a secret tunnel which links the bank to 41 Lothbury but to know this you must have worked in the building. Except this weakness the Bank of England is one of the most secure buildings in the country. Why were the protestors not allowed to march past the Bank of England? Maybe the bank paid off the police to ensure the protest never reached it. If there was any real threat of violence and destruction then the police would never have allowed the thousands of protestors to march alone along Moorgate. After being at Finsbury Square for 15 minutes three riot vans pull up and TSG officers exit the vans at 16:28. The vehicle registrations for the vans are (BX08 LMV – U5557), (BX08 LLW – No Driver) and (BD57 DNF – U5288). Other officers with connected with these vans are CO 5494, TX 175 and TX 490, the time is now 16:44. At around 16:49, three officers from the FIT (Forward Intelligence Teams) enter into Finsbury Square and start giving descriptions of anyone speaking within a group of people. Their first target is a black male who is talking to four other people. They use the Identification Code Four (IC4) and describe him as male along with the clothes he is wearing whilst the police photographer aims his camera at the group. The officer giving this information over the radio is (EG XD 82). The officer then looks up towards the two police helicopters which are static over Finsbury Square before looking around for more targets. Other officers from FIT who are present are Photographer 4615, which I previously spotted at the June 30th Protest at Charring Cross station and another officer (EG CW 3658). At around 17:12, the FIT officers attempt to take pictures of more groups of people and I decide to block the view of the camera. This appears to upset them and a senior officer soon comes over to speak with them. I guess the senior officer reminds the FIT officers that its not illegal nor is it considered obstruction to block the police photographer as I am left alone to continue this action. Eventually what appear to be other protestors go up to the FIT officers and after a brief talk I receive dirty looks from the plain clothes people who I assume are undercover officers. That is unless the protestors are annoyed at me stopping their pictures from being taken by the FIT officers. Most of the officers had left and it was now possible to make my way back to St Paul’s where I heard news of many arrests. It was very unclear what police station the arrestees were taken too and I felt bad at not being able to be at the police station giving moral support like I had received during my incarceration. I was pleased to learn later during the night that a group of people had occupied the police station they were being kept at and most of those arrested were released without charge. My boats had started to give me problems as I couldn’t walk much in them without feeling pain. The weather along with not being able to find an empty tent meant that I was constantly wearing the boats from day to night. It was all worth it and I wouldn’t trade the experience of seeing the first live link up of St Paul’s and Wall Street with Rev Billy who is well known for his unique protest at the Tate Modern in which he carries out an exorcism of the oil. BP is a major sponsor of the Tate Modern. Since my father was also making his way back up north so I decided to make this my last day and return home for some R and R whilst also giving me some time to write what I had experienced during my eleven days at St Paul’s. Tom Rawstorne of the Daily Mail certainly has a lot to answer for with his fabricated news article which attempted to put a bad name on the protestors. He called the protestor’s part time yet it was a full time event for anyone who lived at the occupation. He also, told his readers that the popular activity of the day was “smoking joints and knocking back lager” yet whenever I saw someone drinking lager 9 times out of 10, they were simply passing through and not connected with the occupation except in lining up to get the free food which was on offer for all regardless of status and position. The protestors made everyone welcome which I guess worked as a double edge sword since even those who obviously came to abuse the free food, tea and coffee were made to feel welcome. The very fact that I spent my last night at Finsbury Square sleeping on the N11 bus from St Paul’s to Fulham Broadway and then back in order to get to sleep is testament to the strength of the occupation which has reached full capacity at both St Paul’s and Finsbury Square. Tom Rawstorne finished his article with the following statement: “…with each chime of St Paul’s august bells, confidence in this haphazard and strangely disingenuous protest grows more hollow”. It is clear for me that the only haphazard, disingenuous people out there are the tabloid media who seem intent on destroying the good name of a protest where people are willing to forgo the comforts of a warm dry bed in very cold conditions. The only thing about this protest which could be described has hollow is Mr Tom Rawstorne for his biased and incorrect article which attempts to discredit a strong movement that is anything but part time.